Papa Bird and I use the computer — a lot! He is always downloading old heavy metal videos, buying and downloading music and movies and is trying to get all of our video of Baby Bird off the camera and onto a DVD. Then there’s me. I design blogs on my spare time, write a monthly column, download textures, fonts and patterns for PhotoShop and I manage this little blog here! We need storage, and when it comes to anything Baby Bird related (photos, video, etc. ), we need reliable storage. 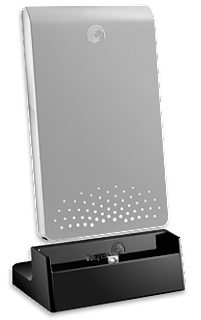 Seagate developed the FreeAgent Go for Mac and PC and it is the ultimate portable storage solution. I was sent a 500 GB FreeAgent Go for Mac to review. At first glance, it is ultra sleek, measuring about 1/2″ thin, and it fits in the palm of my hand (less than 4″ X 6″). The bottom has a non-slip surface and the overall design of the FreeAgent Go matches with our Mac computer. Just to look at it and hold it, I can feel and see the quality that goes into making this drive. It is solid and portable. I can pack it into my laptop carrying case; it barely takes up any room at all. My favorite is how the lights on it light up when it is plugged in and working — very stylish! Papa Bird also reviewed the product as he is big on storage devices. He said he likes the overall design. He also likes that you don’t need to turn it on with a power button as it is automatically powered through the USB cable. He can’t get over how slim the drive is, it’s 1/4 of the size of our current external drive. As a side note, we will be using this drive in place of our current one going forward as our current one has conked out on us before and we don’t trust it any more. He also said it’s easy to hook up and the data transfer is very fast from computer to external drive. The only thing he didn’t like was the short length of the USB cable, but overall he highly recommends it to anyone who wants to back up and store their prized digital possessions. The FreeAgent Go also comes in 250 GB, 320 GB, 500 GB, and 640 GB and it also comes in a lot of great colors. 500 GB stores a lot of stuff if you break it down, that’s up to 160,000 photos, 120,000 songs or up to 500 hours of video – that’s a lot of memories! This would make a great gift for anyone who has a computer and needs to back up even a few precious photos. This is also great for someone, like me, who does a lot of extra work on their computer and needs the storage space to back up their works of art. The Seagate FreeAgent Go 500 GB for Mac retails for approximately $189.99 and can be purchased from the Seagate website. What would you use this storage for? Comments are now closed – Thanks to everyone for entering. Winners will be announced shortly. I would use this to backup my other external drive, which stores my pictures and music. Thanks for the giveaway… I have hundreds of old family photos scanned into my computer that need to be backed up & secured !!! I will be gifting this to my daughter who is constantly downloading music and videos and never has enough room for everything. I will store photos in it. I would give this to my in-laws so they don't lose any pictures of my baby. I would be gifting this to my husband. He'd be very happy! My PC saved photos are so precious I should additionally store them in a safe Seagate 500GB FreeAgent Go. I would use it to store the videos and pictures on my computer. This would be fo ME! I would store tons of Music & music Videos on it along with all the family pictures & stuff for safe keeping. I have tons of pictures to store on it. I would store our home videos on it in case anything ever happens to our computer and minidvs. Then keep it in a firesafe place, only removing it to add more vids. I would back up all our pictures and videos of our family and friends. I would give this to my mom, she needs it and it would be a great x-mas gift. I would keep this for myself and store photos on it. I would give this amazing product from Seagate to my father. He takes TONS of pictures and is always paranoid about losing them. I would love to win this. I would give it to my husband. I think this is neat. Iwould need it for a PC. My dad definitely needs this!! Thanks! This would go to my dear hubby, who is a network administrator. He got something like this years ago and uses it still, but it doesn't have near the capacity of this one. He would freak out if he opened this. I would be wife of the year! I would gift it to my husband. He would be thrilled. I'd store all of my pictures and videos on it. Well I own a dog daycare and we are always taking cute photos and videos of the dogs to send to clients and post on our website. This would be perfect to store all that cuteness in a safe secure place. This would be for my wonderful hubby for Christmas! This would definitely go to my son in college. I will be, being a bit stingy with this one. I will be gifting it to ME and I will store all my pictures and important documents on it. Not gonna lie, this would be a gift to ME for storing my 1000s of photos! I have a mac book and i would like to switch between mac and window for personal and work reasons. I could use the Seagate to partial hold windows operating system, that way I can use my mac for fun, and when I need windows for work I can switch operating systems using only one computer, instead of having to buy a whole other computer for work. I would definatly store all my family photos, I take alot of pictures! I would back up my pictures. I would store our family photos on this and lock it in a fire proof safe.Our home burned down last year and we lost all of the 4 kids' baby pictures.Thanks! myself! I am kinda greedy! I would definately be storing pictures and music, I have a lot of it! I need this to store hundreds of pictures. I love the ease with which the Seagates back up data. I would love to win this for my mother. I spent last weekend reformatting her computer because of a terrible virus. I need to provide her with a backup system so all her data doesn't get lost again. I would definitely back up my image files (thousands of product photos & personal stuff) – We have a PC backup in the house but it doesn't work w/my Mac, I know, because I just tried to do this last weekend! I'd gift this to my dad! I have a 320gb FreeAgent Desk, and I did take it to work with me once to back up all my graphics files. I design posters, brochures and stuff and I like to keep copies for my portfolio. The FreeAgent Go would make it even more convenient to carry along with me to work occasionally. I'd give this to my brother for Christmas. He's a photographer and would love some extra space for all his photos. I'd use it as a way to back up all my pictures and documents! This will be for ME :) To hold all my Grandsons precious photos! Thanks for the opportunity! I would give this to my girlfriend for 2 years and soon my finace ,so she can keep all of her grad. school work, picture, home videos and music on it instead of clogging up her PC laptop. My husband would KILL for this! He would store music and his client's logos (he's a graphic designer) on it. I would be gifting this to my son, who says he's ALWAYS wanted one of these. I'd keep this! I've had one external HD die completely already, so I'm always looking for something else to back my pictures and movies onto, especially the ones of my little one! I will keep this and store my photos and documents. It's shameful that I don't have this already. I would gift this to my younger brother, he's in school right now studying computers and spends most of his time coding and really needs somewhere to store all of his programs! i would give this to my husband for Christmas…he asked for one so he can back up all our data on our computers. I could sure use the extra storage on my old computer. I'll b using it to store all our family photos/video! I'd be giving this to my wife. I'm a young photographer and dont have the funds to have multiple backups. I have had two drived fail on me in the past two years and have lost so much of my work. This drive would help me tremendusly. We'd store all the pictures and videos. I'd be crushed if I lost all the pics of our baby daughter. I can keep my digital portfolio on this. I will be gifting this to my son who is always willing to help me with my computer problems or teach me how to do something on here that I cant for the life of me figure out and its usually so simple with his help. He would love this. I would be giving this to my brother. He travels alot and has 4 computers that he regularly uses – 2 of which are laptops. He aparently emails himself files all the time so he can check it on the computer he needs to use to get access to a file. This, I think, would make life easier for him while travelling as well as for simple logistics! I would use it for all the pictures we have on our computer. I will be gifting this to my husband who has a tone of pictures and other stuff to back up. I would keep this for myself and store my music on it. This would be the perfect gift for my husband! Thank you, Sheri! I would use this for my photo storage. My laptop is running out of space, but it would still be nice to have something portable with my photos on it. My daughter is in the midst of a photo restoration project (some photos are 100 years old) and I'd love to give this to her. I would probably gift it to my son. I would be using this to store our tons and tons of family photos! I would be gifting it to my nephew who has tons of photos and is always needing more storage. I would be keeping this for us, we need to do a better job at backing up our files. I'd mostly use it for pictures. I would give this to my husband as a gift because he has TONS of stuff on the computer that he's always backing up on dvd's. this would be a great gift for my husband for christmas. I need to back up my Quickbooks files for all my clients. i would love to win this to store my pictures and videos on.. I would store years of family history in photos and documents on the Seagate. I would gift this to my mother, so she could store digital copies of all the photos she has inherited from her late mother. I will be storing over 3000 pictures I took during a recent trip to Japan. I recently lost my computer and all of it's contents including years worth of photos. I would love to feel safer about about the new photos that I am putting on my computer. I need to store photos. My wife has a small bookkeeping business and really needs to do a better job of backing up. I would keep this to store my music and photos. I would gift this to my dad, who has TONS of files and nowhere to put them. His desktop makes me dizzy just looking at it. I'd love to help him virtually clean up! I would love to win this so I could gift it to my husband. He's a great guy who's very computer savy and would put it to great use. Thanks. I would give it to my sister since she since's currently building a digital art portfolio for school. this would be great to replace my much smaller backup drive. I need a good back up system to store my photos and files. I would love this to back up the hundreds of pictures that I have of my 2 sons. I always think that I should back them up on CD's, but it would take sooooo many, so this would be a fantastic idea! I will be storing photographs and scanned documents. This would be for me & I'd store all my music & audiobooks on this. I would give it to my husband to store all of his photos and writing stuff (he's a writer and has lots of things to store). My name is Clyde Hale and I would use this myself to store my music, photo`s and video`s. My e-mail address is stick444@gmail.com. I would give this to my Dad. My mother passed away last year and she was the "tech guru" of the house. My father is rather lost in regards to computers — he just got a new one & needs an external HD to back up pictures & such. I would store almost any and all files from my C drive in case of emergency. Please accept my entry. Thank you. This baby I'd be keeping for myself!! I would keep it to store pictures and videos. This would go to my husband for Christmas, for his Mac. It'd prolly be his favorite gift. this would be for my husband's christmas gift! I would love to win this for ME to store all our family pictures. I have thousands of them. Thanks for the chance. I will backup my operating system! I will use this to store complete image copies of my laptop hard drive. Wow! This is like the BEST Prize ever! My husband would love this for Christmas! love to have back up for my photos! As a fellow blog designer, I would use this to backup all of my design work, as well as photos of our two kiddos! Awesome product! I would love to have one to store all the pics of my two kids on it! This would go to my cousin who is a photographer. She has so many photos. She could definitely use this for some safe storage! I would give this to my daughter so she can store the thousands of pictures she has of my grandchildren. I would give this to my husband the computer nerd. I'm a bored college student and I need more Hard Drive room for games and movies! This would be a perfect upgrade to my little problem!! Boy could we use this for our pictures and my husbands business (real estate)!! My fingers are crossed!! I will definitely by gifting this to my husband. He's endured the wrath of losing data before when a hard drive crashed. This would keep our photos and documents safe! I'd give it to my husband, he has a lot of photos, music and work related stuff that could go on it. I'd give this to my wife so that she can back up her pictures and recipes. cdziuba@aol.com This will go to my Tech-savvy son! This would be great to backup all my pictures on. I will give this to my boyfriend, so he can back up all his photos. I'd store all my hours of music, and a lot of my artwork and graphic design nonsense I do. I do have a lot, and I do need a hard drive! I would give this to my boyfriend. He's always juggling around stuff between many USBs. He could definitely use this to store his schoolwork, music, and pictures. I'd save all my artwork and client files on this – and then I'd breathe much easier! I would back all my contracts for my wedding coordination business. I would love to back up my pictures of kids, etc, as we only have an 80gb hard drive and it's pretty much full all the time. thanks. I have a bazillion pictures to back up on it. My computer is running out of space to put them! I would give this to my hubby! He has a netbook and could use the extra space! I would keep this for myself. Need more storage for music and photos. This is going to be a family gift to us. I want to be able to store all of our kids and grandkids photos, and be able to travel and work on a new scrapbook I want to make for each of one of our grown children. I would also like to backup my graphics that I create from my website. I'd gift this to my husband, as he needs back up for all of the computers in the house. He writes, I write, we both have more music and games than we know what to do with and we teach; we both need this back up like crazy, but he's better at the techonological stuff than I am! Thanks for the great giveaway! I need a place to keep all our home video before I have a chance to edit it. I would use it with my husband to back up our pictures and projects. I would keep this for myself. I would save all of my pictures and all of my important papers on it. I would keep copies of my will, life insurance, car title and other valuable information. I would love to win this to give it as a gift to a friend of mine, I already have one. I'm sure that among other things, she would backup her photos. I would put all of my pictures, videos & music on here! I really need one of these! This would be great for all of the pictures we have af all the kids.I would definately be keeping this. We'd use it to backup our important files – especially photos and documents. Just had one hard drive die without too much of importance on it. Don't want a repeat of that if we can avoid it. This would be great for storing all my pics and videos! I would back up my entire hard drive. I only have a 80GB hard drive. I like the fact that it backs up files automaticlly. My choice is for PC. I'd be using it to back up my photos. I would be keeping this for myself. I would be backing up my photos and itunes on it. This would be the very best way to back up your computer in my opinion. I will give this to my husband. He is always needing more storage space even though his Mac has a lot already. I would either gift this to my parents who do not have a back up system for all their digital pictures on their computer. YIKES!!! y husband would have to do the transfer to the hard drive however as he is the computer guru in the family… LOL!!! My son is a software engineer and I'm sure he'd have lots of uses for this. He would be the giftee. Thank you! I'd love to have the Seagate drive to store my family's digital pictures on–I have them on an aging external hard drive and I'm worried that it may crash before I move them to a new drive. I have a Seagate external hard drive and work and I love it! Thanks for the opportunity to maybe win a new drive for my home computer system! I would love to win this for my husband. He would really appreciate it! Thank you. I would give this to my girlfriend, she has been wanting an external drive. It would be for me–I'm the computer geeklet, and am constantly running out of space. I'd probably store our photo's on there, thanks for the chance. Wow, what an awesome device! I would use it to hold all of my pictures, songs, and movies! I would use this with my wife's computer to backup pictures. I'd mainly backup my schoolwork, writings, and photos. I would store my growing picture collection! I at least take a few photos a day. This will be for hubby for all his music! His hard drive is just about full so this would be awesome! I would love it to back up my pictures and my music. I'd give it to my wife, who has lots to back up. This would be great for me to back up all of my photos. This would be a great gift for my daughter. She has lots of movies that she has edited on her computer and this would be perfect for storing them. Would probably use it as a Time Machine backup. I would give this to my mom so that she can store all the pics of her new grandson! I would give it to my hubby to back up his laptop. I would probably give it to my sister because she is always complaining about how small her hard drive is. I would store my writing and my artwork on the backup drive. I'd also backup my computer, which i know is very important. I would give this to my husband as he is a techy too. What would we store on it? mmm! More than likely pictures/videos of our family, back ups of them and then store it in the safe which is fireproof. I would love to give this to my brother, he moves alot of data around and this would help him do it alot quicker. My sister's computer is on its way out, so I'd love to give her this to backup everythin important. I would give this to my wife as she desperately needs a backup drive for all of our kid photos and videos! Thanks! I would gift it to my dad. He has done so much for us and has done tons of research on our family history. With all the work he does, he could really use a great storage device like this one. I would use this to store my music, movies and photos on. After having a hard drive crash, it's great to have a back-up! I would use it to store my pics, musics and business documents. It would be great to know it is all safe. I will be giving this to my wife – she is a avid amateur photographer and needs her own drive to store all of her pictures! Thanks for having the giveaway! I will store all my photos and work stuff in the Seagate FreeAgent for PC. I just need this so much because I work in an Internet company. My nest could sure use an external hard drive! Especially as we're about to have baby 2.0! I would gift this to my husband. He would love it! He is in charge of backing up all our precious photos of the kids' first years. I'd use the Seagate FreeAgent to store video. I take quite a bit of it, and storage is currently a problem. I would backup my files and store all the music I've illegally downloaded over the years as well as torrents of movies. Hey at least I'm honest. This would be for me. I'd love to have a reliable back up for all the pictures and videos of my daughter. I would use the Seagate FreeAgent for PC to store all the many memories of our little beans life so we could add them to her life book as she grows and she learns her story. We all have them. Thanks for this opportunity. I'd keep it for myself to store all of the photos and videos I've taken so far. I would love to win this. Besides using it to store digital pictures. I do genealogy research and have thousands of files I need to back up. I'm going to be giving it to my girlfriend. She has a small business and could really use something like this. I would love this for my wife. 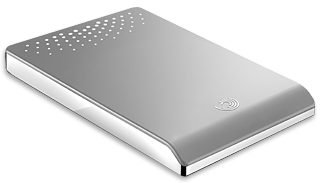 What wouldn't you use the Seagate Freeagent Go to store? Pictures, recipes, business files, the list could go on and on. I would use it for my Music and photos!! Thanks 4 the giveaway. I would give this as a gift to my guy who is an avid photographer. He lost a lot of photos when he had computer problems. I think if he had this his photos would be safe from now on. i would store all my songs and photos on it, i have a ton! I would love to win this for myself to store all my pictures and videos. I would use it for me and store all my videos and pictures! What an awesome giveaway. thanks!! I would be giving it to my husband who just purchased our first mac computer! I'd get it for a PC. I'd gift it to my husband Chuck. He'll probably store all the bill paying stuff and tax stuff on it, plus favorite photo's, resume stuff etc..
We would definitely be using this for our media center! I will use this baby to store my photos. I would love it. I would gift this to my dad! I will giving it to my daughter as she has never backed up her computer before, thanks. Awesome giveaway! My husband would love this under the tree this Christmas! This would be a great xmas present for my husband! I would give it to my brother! just found out our computer is running out of space for pics and such. I would love this one. I would store my music and my pictures. I will be gifting this to my son as he works in the computer industry and would really appreciate it. I'll keep this and store photos on it! Seems this is a VERY popular giveaway! BUT i want it!!! I would gift it to my hubby– this really is his 'bag' (said in Austin Powers voice), but for sure we would use it to store our bevy of pics of the kids. Would be a shame to lose all that…..
i'd keep this one for myself and store pictures and videos of the kiddos! I would give this to my husband so he can back up our iTunes, photos, vidoes and financial information. I would use this myself to store all my photos and videos from family events and vacations. I would love this for myself! I have alot of photos on here and they are slowing down my computer!! If I won this, I would gift it to me! I need one to store all my photos, photos and more photos. Plus I would store my many music files and graphic files. Great prize! I would store my music files on it. I'm a fitness instructor so I have a lot of music!! I need to store all my photos and mostly, music! I'd definitely be giving this to my hubby!! I'd keep this for me and hubby for backing up kids photos and videos! I would keep this for myself and use it to back up the thousands of pictures waiting to be eaten off my computer by a crash. Wow, what a great device!! We would deffinatly use it to hold all of our pictures, songs, etc. Having a backup sounds really great! I always hear about people losing alot of their data/pictures and I always cringe when I hear that! I would give it to my in-laws to store the over 7,000 photos they have of my two little girls. Awesome contest, love husband/wife reviews!! Wow what a neat gadget!! I would gift this to the whole family so we could all save a little bit of our favourite things on it. This is a great contest and thanks for all the hard work it took and the exciting prizes. Its exciting each morning to check what todays giveaway is!! I would gift this to my hubby who would freakin LOVE it! I would win major wife points for this one!! I would love to give it to my husband, who downloads stuff all the time. Hi, my name is Kristina. I'd gift this present to my dad. At 60 years young, he is a 'big kid' at heart and loves gadgets that make his life easier. He'd love this!!! I entered in the Early Bird Entrants so my second comment is that my hubby would fill it with his style of music (bleh!). Wow so cool! If I won I would gift it to my wonderful hubby :) he totally deserves it! Ooohhhh! I need one of these to store my thousand of photos and videos of my little one!!!! Sheri, thanks for your reviews and the opportunity to win these prizes. What a great storage device. I like its simplicity and am amazed at how much data it will hold. I would use it myself, mostly for pictures. I do our family heritage and have collected a lot of pictures, which is filling up my hard drive, and it would be great to have them all at one location.